Trade High Award Winners, from left are: David M.McIntire, 24 Lincoln St., Ronald E. Pearson, 17 Menlo Ave., Lee W. Oliver, 48 O'Callaghan Way, Alleyn W. Parkinson, 488 Chestnut St., and Gerald F. Belliveau, 136 Allen Ave. Pearson won two awards, a $200 bond from General Electric Co. and drafting instruments and handbooks from local 142, American Federation of Technical Engineers (AFL-CIO), Oliver also was presented with instuments and handbooks from Local 142. McIntire won $150 from the Lynn Teachers Union for tools or tuition. Pearson was awarded $150 by the Lynn Teachers Association and Belliveau was presented with $100 from Fairview Machine Co. Inc.
A total of 97 boys were graduated this morning from Trade High School during ceremonies in the Harrington School auditorium. Diplomas were presented by The Rev. F. Oliver Drake, pastor or the Broadway United Methodist Church, a School Committeeman and main speaker for the exercise. All but two of the school’s 22nd graduating class are from Lynn. Gerald F. Belliveau, Nicholas P. Callas, Richard W. Cooper, Richard S. Davis, Douglas R. Hyde, Walter W. King, Thomas McLaughlin, Alleyn W. Parkinson, John J. Razney, James L. Ridley, Robert Scott, Thomas P. Sylvia, Philip R. Webster, Bryant B. Wright. Dennis J. Amirault, William R. Appleton, Stephen F. Burke, John A. Colanton, Lee M. Johnston, Kenneth Jordan, Michael A. Marino, Raymond G. Paradis, Jr.
Michael J. Barry, Stephen F. Carter, Bertrand Y. Champagne, Steven J. Clifford, Ronald H. Cormier Jr., Gerald B. Cronin, Thaddeus J. Czarnecki, Joseph D. Gauthier of Roxbury, David M. McIntire, Ronald W. Nute, James M. Peabody, Maurice W. Sarno, Robert A. Surawski, Nelson J. Thompson, Kenneth W. Ward, Elliot K. Willard. Wayne R. Altavilla, Kevin Ballum, Roger Branscomb, Carl Cameron, Donald A. DiTullio, Lee W. Oliver, Ronald E. Pearson, Barry Turmenne. James E. Belliveau, Edward A. Brown, William J. Burgess, Anthony M. Conai, James Crosby, Daniel P. Deveney, Michael J. Dollard, William E. Emery, Gary J. Feliteau, Richard M. Gordinas, Bradley J. Hanson, Leo J. Hill, Charles H. Houle, Michael T. Kwiateck, George W. Lewis, Stephen T. Lyon, James A. O’Neill of Danvers, Kevin P. Robichaud, Arthur R. Rohan, Jon M. Santerre, Keith F. Small, Craig D. Trainor, Joseph H. Zarborowski. Michael P. Collins, Roland DeQuina Jr., Richard DePrizito, Gary R. George, Curtis D. High, Paul L. McGrath, Edward A. McKansas, Brenton S. Ringer, William J. Sniegosgi, Kevin J. Sullivan. Steven N. Basterache, Donn W. Belair, John J. Boisson, Richard W. Doherty, William R. Jenkins, Paul R. Marzeotti, Edward A. 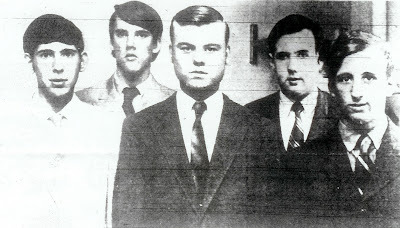 Mills, Frederick C. Minney, Robert J. Paradis, Delphus Taggart. Vernal Brock, Thomas D. Champigny, Donald F. Colpitts, Edward Fritz Jr., Steven A. Hobbs, Richard M. McCormack, Donald W. Melanson. Trade High School, a male preserve since it first opened its doors in Cobbet Junior High School in 1945, is scheduled to hear the rustle of skirts in the fall of 1971. That's when the new 1,000 student, $10 million Trade High is due to swing open its doors on 19 acres at the corner of Summer and Blossom Streets in the Lynnway-Summer urban renewal project. Trade High Director Michael C. O'Donnell said the new school will be co-educational with additional courses and expansion of existing programs. Between 80 and 100 boys were refused admission last fall because the school is opening at full capacity in its quarters at Cobbett, O'Donnell explained. He said there is "a tremendous demand" for vocational training in Lynn, and he estimated the granduating class in the new school will be more than double today's 97 students. The school offers a three-year course. Its first graduating class was in 1948, when the school had 200 students and 18 teachers. Current personnel include 21 teachers, one guidence counselor and two office clerks. The staff's number is expected to rise proportionately to the three-fold student increase when the new school reaches capacity of 1,000. Present enrollment of 300 is divided about everly among the three years of course offerings and there are few dropouts, said O'Donnell.